Medlock Area Neighborhood Association (MANA): 330-unit apartment complex coming to corner of Church St. and Milscott Dr.
330-unit apartment complex coming to corner of Church St. and Milscott Dr.
Atlantic Realty Partners is pleased to announce that on May 27, 2014, the DeKalb County Board of Commissioners approved its applications for the development of a 330-unit apartment complex to be located on 9.4 acres on the corner of Church Street and Milscott Drive in Decatur. The site was previously occupied by a car dealership but has been vacant for years. The multifamily complex, to be named “The Reserve”, will feature two “U-shaped” buildings enclosing a terrace courtyard with landscaping and a swimming pool. (See attached site plan). To maintain an urban feel, the buildings are situated directly adjacent to the street and will largely shield the parking lot from view. Additionally, the developer will install sidewalks and landscaping along both Church Street and Milscott Drive. Specifically, the Board approved (1) an amendment of the Comprehensive Plan Map from Commercial Redevelopment Corridor to Town Center; (2) a rezone from General Commercial to Office-Institutional; and (3) a Special Land Use Permit to increase the allowed height to five stories. The project was approved site-plan specific and subject to 17 conditions (attached). The developer wishes to thank all those who attended the public hearings and meetings regarding the project. Community input resulted in a final product far superior to what we started with. Atlantic Realty would like to specially thank the members of the Cross-Neighborhoods Committee for their input and informal support throughout the planning process. We look forward to seeing this project finally come to fruition and maintaining a continued presence in the local community. 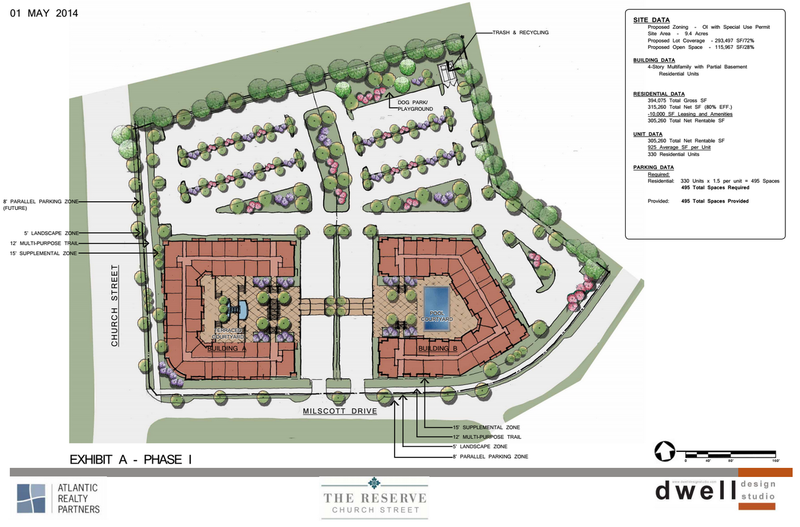 "The Reserve": residential development on the corner of Church Street and Milscott Drive. Click to enlarge or see the original file here.